The wide composition of this 4.4% session IPA nicely illustrates 21st Century Amendment’s approach to using the entire canvas of the can to tell a story in 360 degrees. Rather than centering the art smack-dab in the center, the graphic uses deep space as the backdrop to add a smart touch of infinity as you spin the can. The seasonal typically drops in late winter, an alternative to all those boozy holiday seasonals. Looking like Mount Rushmore come to life, this IPA embraces some serious West Coast attitude. The first taste is a big one, dominated by three hops—amarillo, cascade, and simcoe—with a respectable 7% ABV. This early winter seasonal show’s FDR as he preps for another Depression-era radio address to the nation—an English-style ale that feels like a warm hug to help you fight through the season ahead with an ABV that hovers just under 8% to help fortify you against the harsher edges of reality. Another seasonal (this one dropping from April through September), Hell or High Watermellon depicts a central figure of American lore—the Statue of Liberty—resting comfortably on a West Coast icon, the Golden Gate Bridge, easily the most recognizable landmark in the brewery’s home city of San Francisco. This elusive seasonal double IPA isn’t always on offer. But the label does a great job of illustrating the brewery’s commitment to tell a story with their art. And this one does so quite literally, displaying the brewery founders Nico Freccia and Shaun O’Sullivan as they plot to break out of Alcatraz and free the hops from the Hop Syndicate, who are hoarding the essential ingredient in some remote warehouse in the city. Much like the American Revolution, the art for their Back in Black black IPA evokes revolt—in this case, by recreating Paul Revere’s famous midnight ride as the brewery pushes against the standard British-style IPA. For Monk’s Blood, the first beer in their Insurrection series, the brewery leaned more heavily on text than image to tell a story—provided you’ve got good enough light to read the words, which hampered by a small point size and over-flourished font. The beer itself? Not quite as subtle. It was crafted with Belgium’s De Struisee Brouwers: a Belgian dark-strong made with mission figs, Belgian dark candy sugar, and vanilla beans, aged over oak chips. 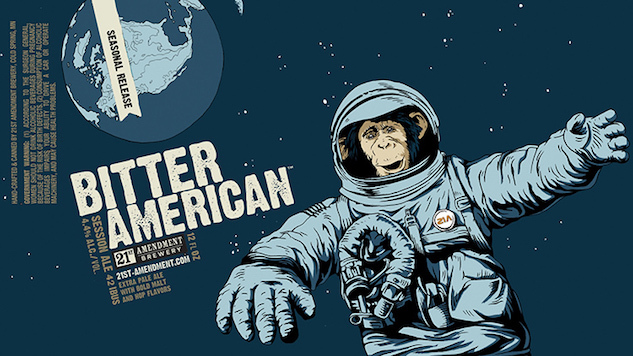 The art on 21st Century Amendment Brewery’s cans leans heavily on the icons of Americana—the Statue of Liberty, Mount Rushmore, Washington crossing the Potomac River…But the artwork feels more playful than full-on patriotic, much to its benefit. After all, if there’s one thing all beer-lovers should celebrate, it’s when the 21st Amendment was added to the Constitution in 1933 to repeal prohibition. To execute the first batch of graphics, the San Fran-based brewery worked with a handful illustrators (Joe Wilson, Jon Contino, and Kim Seilbeck), and TBD, a Bend, Oregon-based agency (the same who worked on the great graphic of Odell Brewing). And while TBD closed shop a few years back, 21st Century Amendment’s cans continue to stand out on the craft beer shelves. Here are a handful we absolutely adore.